American Whitewater Expeditions offers the most fantastic one day rafting tours on the American River, rafting on California’s most popular white water rafting river. We provide full day rafting tours that are perfect for a wide range of people wanting to experience California rafting at its best. From the entire family (kids ages 6 and up) to corporate groups, bachelor or bachelorette parties to Boy or Girl Scout groups, school groups to church groups and everything in between can experience the joys of rafting in California on the American River. Ours rivers are dam controlled and we are guaranteed recreational water flows. Both the South Fork and Middle Fork rafting trips are guaranteed throughout the summer because of the lakes, reservoirs and dams that feed these rivers. There is no other river system in California that can guarantee awesome rafting flows during the summer months regardless of drought conditions. So if you live in California during a drought year you may not be able to shower – but you can most certainly go rafting on the American River! As you float and paddle through on one of the most historic and gorgeous stretches of river in the western United States, your highly experienced guide will tell the story of the area’s human history, wildlife and exploration during the Gold Rush era, and the river’s modern role in California water and power delivery system. Because the 3 forks of the American are an ideal section of river for all levels of rafting participants, we recommend one of these this full day American white water rafting trips for anyone planning a family rafting vacation, youth group adventure, family reunion, scout trip, and for other groups seeking an active California adventure vacation. Whitewater rafting on the American River is a classic California adventure, and for most guests, it is truly the highlight of their trip. We have four fantastic full day trips to choose from. Each is very distinct and offers an insight into the areas natural beauty and history. From the high adrenalin spring run on the Class 5 North Fork of the American to the Class 2/3 rafting on the South Fork Lower Gorge – we offer a rafting day trip that will satisfy every rafter! Our most popular day trip is the 15 mile long Class 2/3 South Fork Lower Gorge. This South Fork American rafting trip is probably the perfect rafting trip for anyone – a perfect mix of exciting whitewater rapids and relaxing times spent floating down the pools. Perfect for families with small children to bachelor parties looking for a fun time! We are not kidding when we say it’s a perfect trip for anyone ages 6 to 106! The Middle Fork of the American is one of the best commercially rafted stretches of white water rafting in the US. 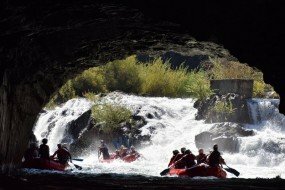 It is a wilderness trip down deep canyons filled with human history from the Gold Rush and has world class whitewater including the world famous Tunnel Chute Rapid. This is one of only 2 rapids in the world where you get to raft through a tunnel. The only other is on the Shotover River in New Zealand! This is a gem of a trip you will never forget. The South Fork Whole River is likely the longest single day trip offered in the US! At 21 miles this is one fantastic trip filled with thrilling Class 3 whitewater and mellow relaxing stretches filled with human history from the Gold Rush era. This trip starts at the very top of the South Fork of the American River, just below the Chili Bar Dam and ends in the legendary Folsom Lake near Sacramento. The North Fork of the American is the best Spring rafting day trip in California. This 9 or 11 mile run consisting of adrenalin packed Class 4/5 rapids and timeless natural beauty. This is a free flowing river dependent on snowmelt and rainfall. From intense rapids to gorgeous river canyons filled with wildflowers and California Poppies in bloom – this is one trip you will always remember. Enjoy these absolutely fun filled thrilling and relaxing rafting day trips and get yourself away from the stresses of everyday life. Recharge, invigorate and motivate yourself with an absolutely amazing day spent on the river. So come and enjoy a fun filled day of whitewater, swimming, water fighting, or hearing about river lore and history from one of our highly experienced and knowledgeable guides. We offer trips for all experience levels we will customize a trip that is right for you and your family or group. The thrill of running the whitewater with our professional guides will create a summer adventure everyone will absolutely love. The longest Lower Gorge Run on the South Fork and our most popular one day rafting trip. Spend a relaxing day filled with moments of excitement paddling through fun rapids. Perfect for first timers, families with young children and groups looking for a fun day out. 8% Government Land & River Use Fee is added to all trip prices. Be sure to check out the family special, group rates and last minute specials. Covering 18 river miles, you’ll experience one long, exhilarating day on the river on this truly scenic rafting trip. The ultimate in “Big Drops”, the Middle Fork’s Tunnel Chute Rapid is a one of a kind experience. Are you looking for a super full day of whitewater rafting on a river that’s just packed with fun, excitement, and thrills? Then this is the trip for you! You’ll raft the entire 21 mile length of the South Fork Chili Bar and the Lower Gorge Sections in a wet and wild one day trip. Come on board for the trip with the most action and thrills, as well as the most spectacular scenery comprised of amazing vistas, lush foliage, and spring wildflowers on display. The ideal one day spring run for those with previous rafting experience or first timers who want to go for the gusto on their first rafting trip. What could be better than running the Class V North Fork of the American River? Running it twice in the same day!